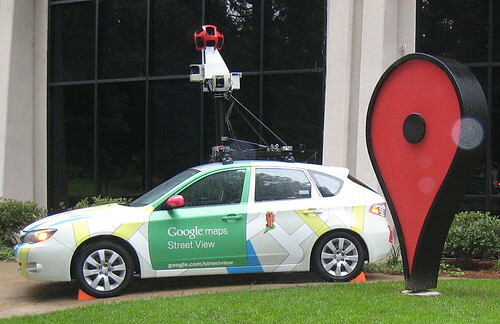 At the end of August last year, there were reports of the Google Street Views car being seen around the neighborhood. For the half dozen or so people on the planet who don't know what Street View is, it's a terrific value-added feature that the Google Maps folks created by photographing many if not most of the primary and secondary streets around the world. Using Street View you can not only see a satellite view of your location but actual cached photos. 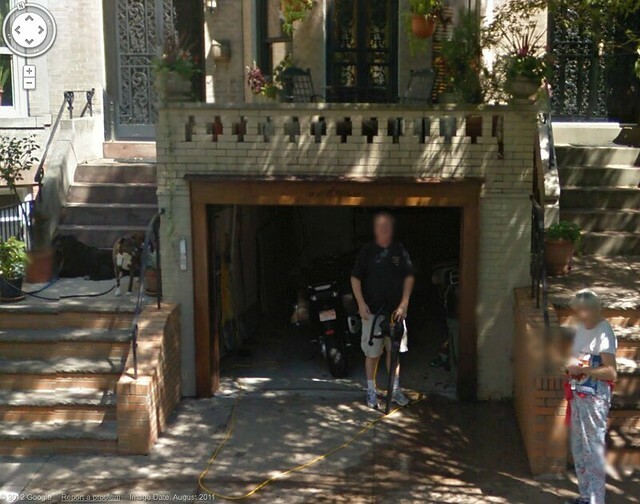 It's also rather hard to miss the Google car as it's about as subtle as a Oscar Meyer Weinermobile. Besides a paint job that looks like a cross between a Peter Max-themed commune bus and a parted-out Toyota Prius Hybrid it's got a six foot mast on its roof with a device on top that looks like it came from War of the Worlds. It's actually a high-definition camera with 15 lenses and a Class 1 laser range finding device. Anyway, I was leaving the Owls Head Park dog run with the pooches one morning when I saw the Google car cruising down 68th St in Brooklyn. I assumed that it would probably hit my street in the next 15 minutes so I hustled home to sit on the stoop and see it close up. I was trying to think of some clever goof I could do for the camera. Over the years, Street View's cameras have captured everything from rennaissance sword fights and naked people to arrests in progress and even dead bodies. It would be hard to top that so I figured I would just bow to it as it passed. Something completely lame like that. The dogs and I waited on my stoop for 15 minutes before my ADD kicked in and I decided to change the oil in my motorcycle in the garage instead. As I was warming up the engine, an elderly lady stopped on the sidewalk and extended pleasantries with me. With the motorcycle still idling, I grabbed the leaf blower and started sweeping the sidewalk. With a 700+ pound motorcycle, I like maximum traction with the sidewalk as I pull that monster out of the garage. And that was the moment that the Google car chose to arrive. I gave it a quick wave, but was a little too late I'm afraid. But she didn't miss it. "No, that's the Google camera car." "Google... Google Maps... the computer search engine..... computers??"